I was born and raised on the farm. When I was a kid it was a huge deal to go shopping in the city (I am saying city VERY sarcastically here!) of something less than 20,000 population 40 minutes to the north of our house. My parents were incredibly generous to make sure me and all of my siblings had a chance to see some world before we headed off to college & then really did live in a city – Lincoln, NE for three of us and Chadron, NE for one of my brothers. Like most kids, I think we thought of ways we could avoid going back to the rural life we knew so well…I guess all of us had country life in our heart. We are all four back – living and loving farming and/or ranching! A while back I got the opportunity to spend just a little over 12 hours in New York City – I know, if one is going to travel that far, they really should stay long enough to enjoy the trip! Oh well, maybe next time. 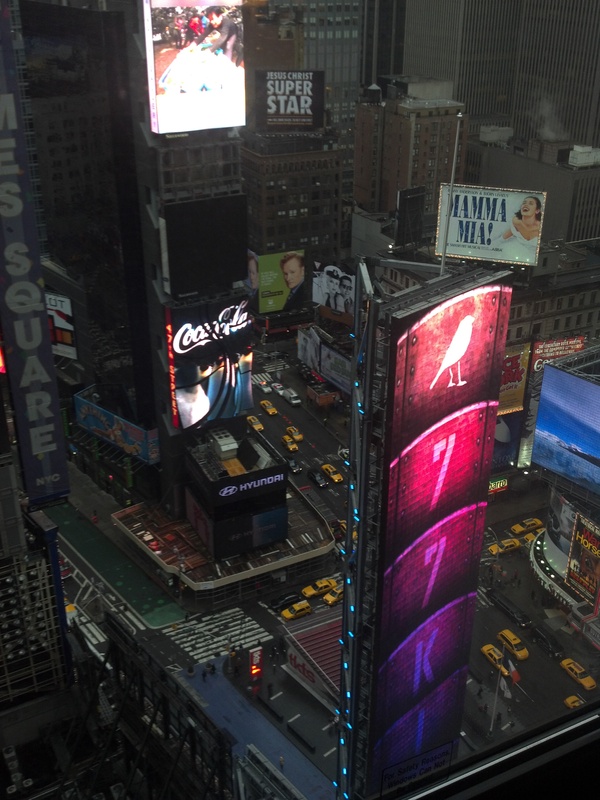 I felt so tiny next to the buildings – I wasn’t in just any part of the city, my room was right at Times Square! The view from my hotel room in New York City. I was there for CommonGround, along with my friend Dawn (she has such a cool name!) from South Dakota. We were at a food and nutrition editors showcase event. We both just did what we can do so well…talk about life on our family farms. We got to talk to editors from magazines and shows that I hear about all the time…Food Network, Martha Stewart Living, Rachel Raye, and many, many more. I think we were the only booth that wasn’t handing out delicious food samples, but we had no problem attracting visitors! We were so honored – they really wanted to talk with us! I have been back home and back to reality for a while now. I LOVE visiting the city, but I LOVE, LOVE, LOVE the rural life I get to enjoy everyday.